“Frequent Flyers” 1995 by Seward Johnson. 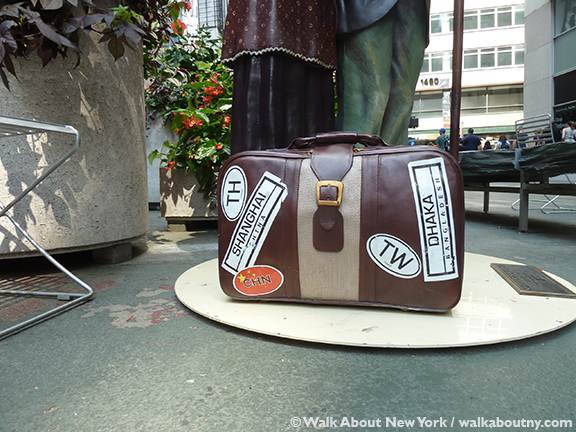 Carrying the NY Times: “Frequent Flyers” detail, 1995 by Seward Johnson. 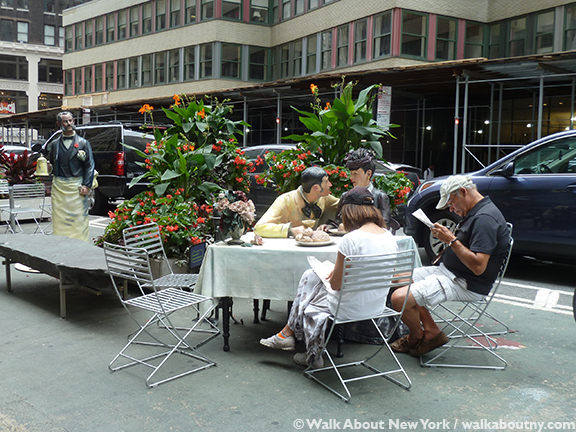 Labeled kitschy by highbrow art critics, Seward Johnson’s life-like and life-size sculptures are a hit with the man and woman on the street. Specifically, that street is Broadway between 36th and 41st Streets. That is where 18 of the Hamilton, New Jersey sculptor’s painted bronzes can be found until September 15th. 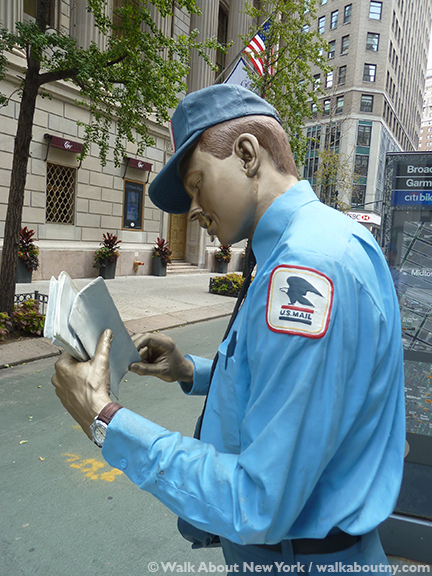 “Special Delivery” 1993 by Seward Johnson. “Special Delivery” detail, 1993 by Seward Johnson. Such well-recognized figures as Marilyn Monroe, Abraham Lincoln, the sour-looking duo from Grant Wood’s 1930 painting American Gothic; three whirling-twirling couples from paintings by French Impressionist Pierre-Auguste Renoir; plus, Mr. Johnson’s interpretations of everyday people doing everyday things are scattered amongst the lush planters, and the tables and chairs set-up within the pedestrian plazas along Broadway as it winds its way north through Manhattan’s Garment District. 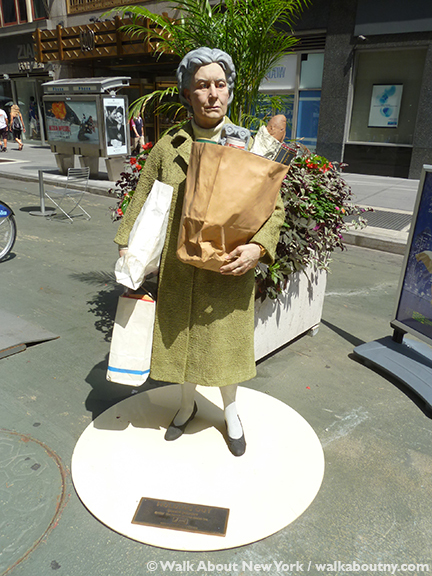 Grim shopper: “Holding Out” 1987 by Seward Johnson. “Holding Out” detail, 1987 by Seward Johnson. As part of its Summer Arts on the Plazas program, the Garment District Alliance has staged the largest public installation of Mr. Johnson’s work to be seen in New York City. 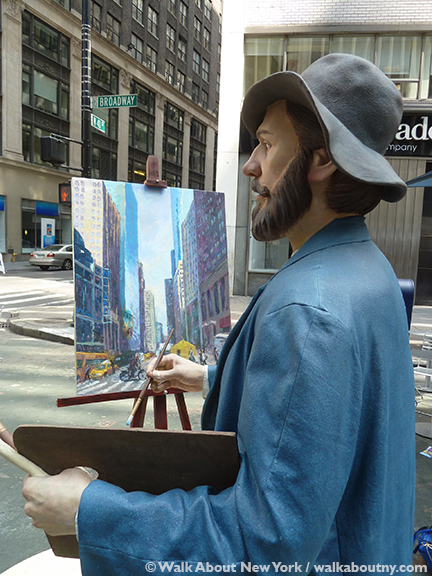 Titled “Seward Johnson in New York, Selections from the Retrospective” the works are drawn from three of his major series: “Celebrating the Familiar,” “Icons Revisited” and “Beyond the Frame.” After training and briefly working as a painter, Mr. Johnson began sculpting, and has been creating his bronzes for almost 50 years. More than 450 of Johnson’s bronzes are part of private and museum collections. They have been displayed in many public spaces, including prominent public venues such as Hong Kong’s Pacific Place, Les Halles in Paris, New York’s Rockefeller Center, and Via Condotti in Rome. Mr. Johnson has upcoming exhibitions in Amsterdam, Chicago, Los Angeles, San Francisco, Paris, France and Capri, Italy. 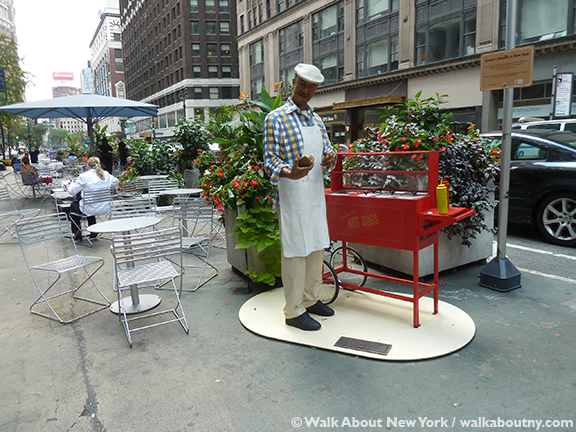 “Relish, Too?” 2013 by Seward Johnson. 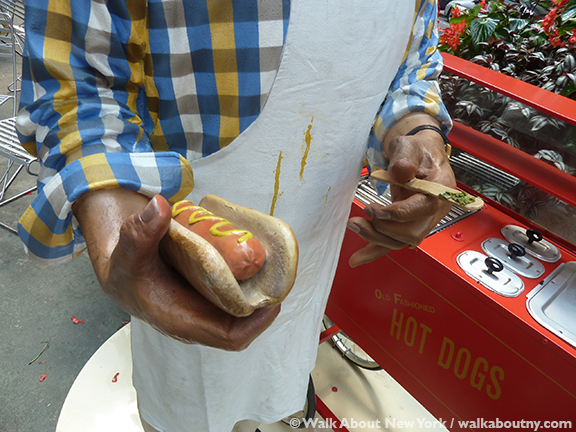 Mustard on the apron: “Relish, Too?” detail, 2013 by Seward Johnson. Everyday people doing everyday things are the subjects of Mr. Johnson’s series that is called “Celebrating the Familiar.” Because of the recognizable scenes, viewers relate to these bronze artworks and get a good laugh because they can imagine themselves as part of the scenario. Those showcased are Special Delivery; Holding Out; Relish, Too? 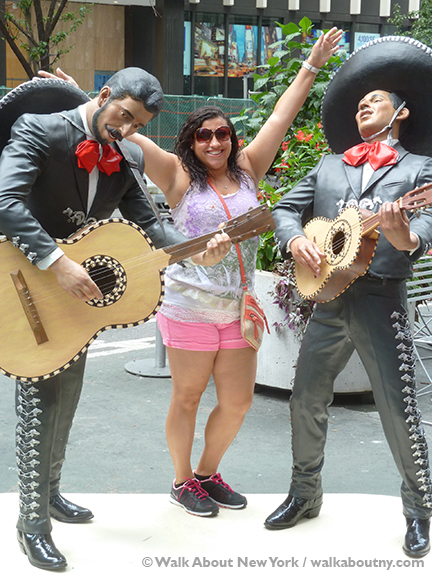 ; Frequent Flyers; Sidewalk Concert; Things to Do; Los Mariachis; and The Photo Shoot. This group of bronzes can be found starting at the southern end of the exhibit at 36th Street. 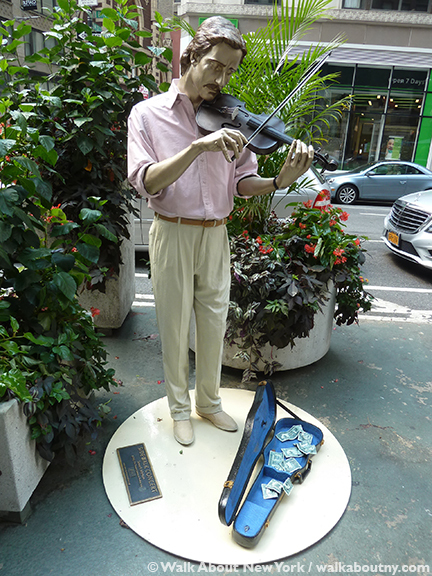 Busking on Broadway: “Sidewalk Concert” 1992 by Seward Johnson. 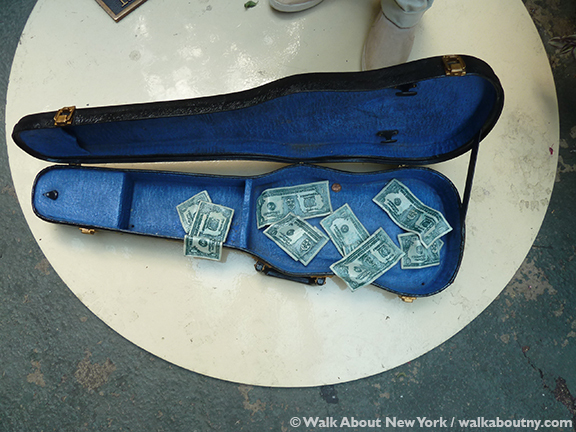 A good day: “Sidewalk Concert” detail, 1992 by Seward Johnson. “Beyond the Frame” is a series that is made up of complex tableaux that allow viewers to insert themselves into scenes from French Impressionist paintings. 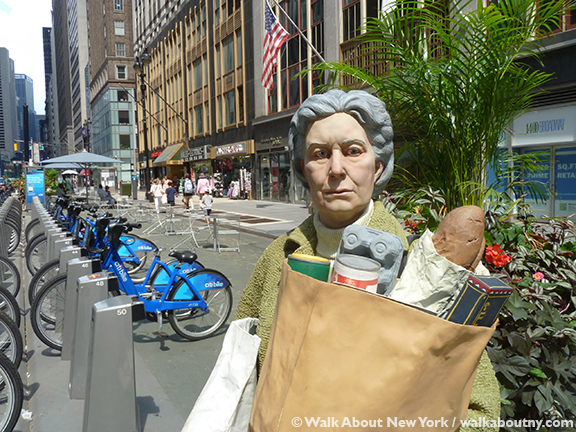 The ones that are part of Seward Johnson in New York are simpler than those he has created for the Grounds for Sculpture. 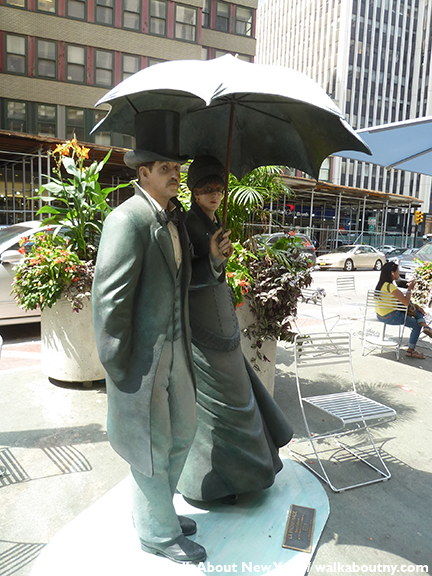 As you walk along the Broadway plazas toward Times Square you will see the following examples from this group, La Promenade; Eye of the Beholder; Monet, Our Visiting Artist; Whispering Close; Time for Fun; and Turn of the Century. 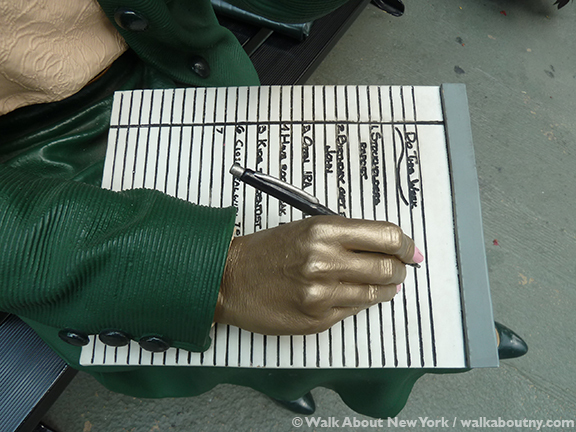 “Things to Do” 1992 by Seward Johnson. “Things to Do” detail, 1992 by Seward Johnson. Two guitar-wielding musicians are the characters in Mr. Johnson’s Los Mariachi. It was one of the most popular sculptures for posing tourists. Mr. Johnson can take as long as two years to create one of these works of art. 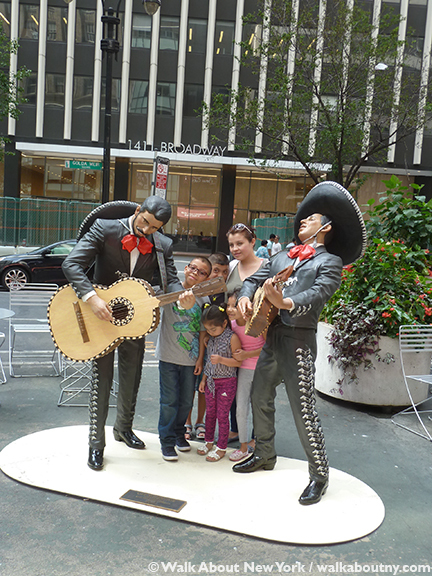 Young musicians: “Los Mariachis” detail, 1994 by Seward Johnson. 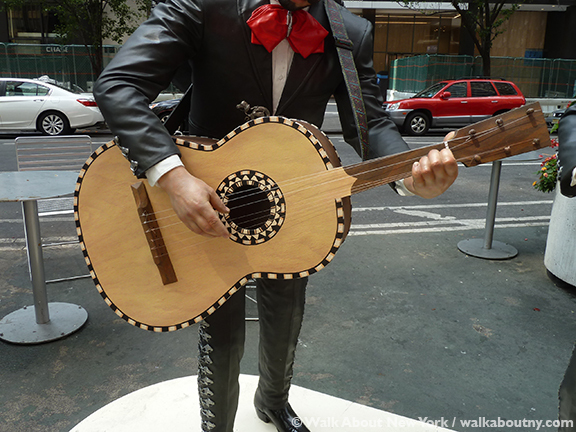 “Los Mariachis” detail, 1994 by Seward Johnson. The strings of the guitars are heavy nylon thread; they can be plucked. One of the favorite and amusing touches for Los Mariachis is the singers’ patent leather boots! Details! Details! Details! 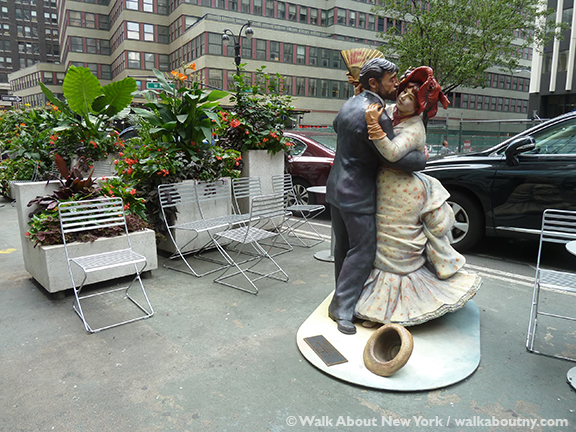 Celebrate: “Los Mariachis” 1994 by Seward Johnson. The 85-year-old artist current project is a sculpture of Winston Churchill painting at his easel; this is a commission for a site in California’s Napa Valley. A sculpture of John Steinbeck for Sag Harbor, Long Island is on Mr. Johnson’s drawing board too. This month, a 25-foot-tall version of Marilyn Monroe was installed in Dalian, China. Mr. Johnson is the founder of Grounds for Sculpture, a 42-acre park located in Hamilton, NJ, featuring large-scale, contemporary sculptures, many of them his. He is a grandson of Johnson & Johnson co-founder, Robert Wood Johnson. Closest to Times Square are works from the series titled “Icons Revisited.” They depict moments in American history that have become part of pop culture. The subject matter for these sculptures is of notable personalities and well-known works of American art. 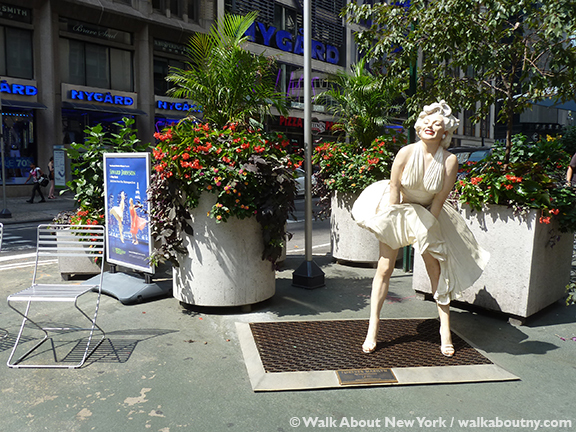 Seward Johnson in New York will feature Forever Marilyn; Return Visit; God Bless America; and Embracing Peace. 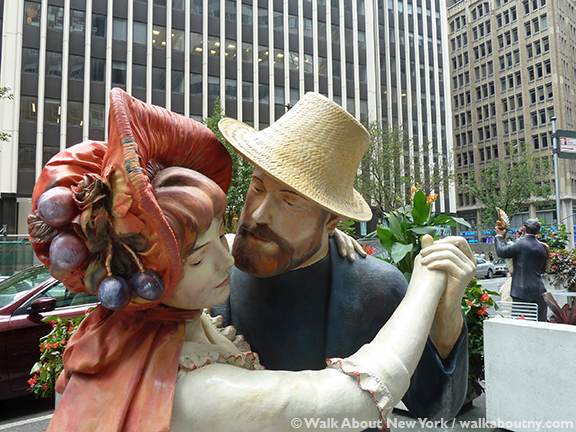 “La Promenade” 1995 by Seward Johnson. “La Promenade” detail, 1995 by Seward Johnson. A detail from Gustave Caillebotte’s 1877 painting Paris Street, Rainy Day became Mr. Johnson’s La Promenade. This example is one of eight castings of it. The original painting is part of the collection at the Art Institute of Chicago. Mr. Johnson turned his talents to the medium of sculpture in 1968; but because all his bronzes are painted, his training in that field has been put to good use. 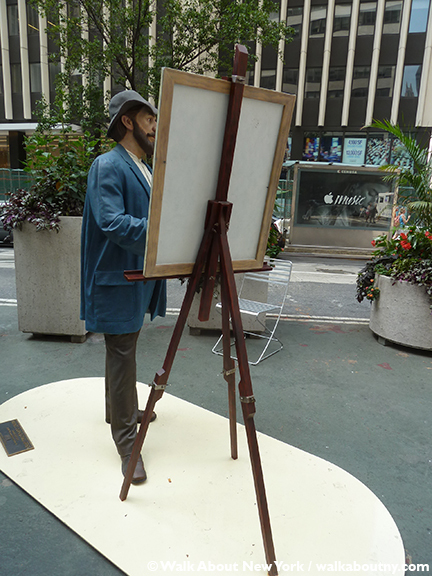 En Plein Air: “Monet, Our Visiting Artist” 1996 by Seward Johnson. “Monet, Our Visiting Artist” detail, 1996 by Seward Johnson. With Monet, Our Visiting Artist Mr. Johnson pays homage to Claude Monet’s attraction for painting en plein air, when he stepped out of his studio to paint the world around him, in its natural settings and with varying levels of natural light. It was Monet’s painting Soleil Levant (Impression, Sunrise), displayed at the first Impressionist exhibition in 1874, which inspired the use of the word “Impressionism” to be applied an entire artistic movement. Depending on where this bronze is exhibited, Mr. Johnson changes the image painted on the canvas at Monsieur Monet’s easel. For example, when a casting of this work was visiting Raleigh, NC in May 2014, it was the city’s Progress Energy Center for the Performing Arts. Here in the Big Apple, it is the skyscrapers of Times Square. 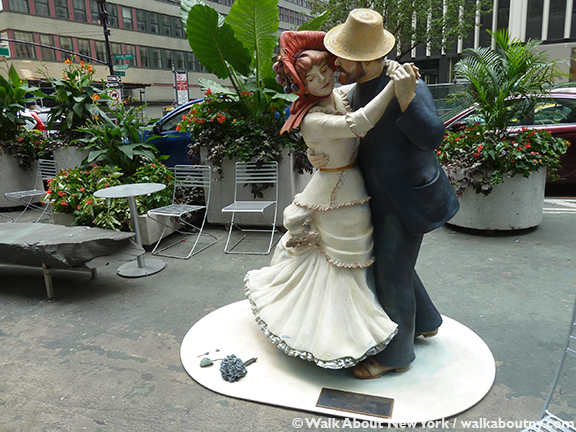 Dancing in the Street: “Time for Fun” 2000 by Seward Johnson. “Time for Fun” detail, 2000 by Seward Johnson. Pierre-Auguste Renoir’s 1883 canvas Dance in the Country, which is part of the collection at the Musée d’Orsay in Paris, was interpreted as Time for Fun by Mr. Johnson. Three paintings of dancing couples by Renoir served as models for three of Mr. Johnson’s works in the “Beyond the Frame” series. Time for Fun shows the viewer the joy of this dancing couple. It is possible to get a sense of their sweeping movement much better in the three-dimensional form. 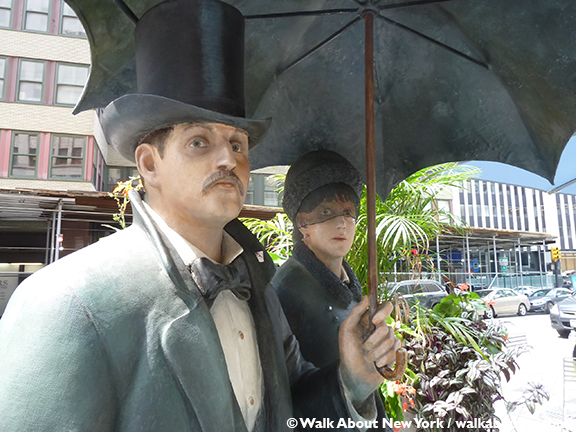 “A Turn of the Century” 1995 by Seward Johnson. 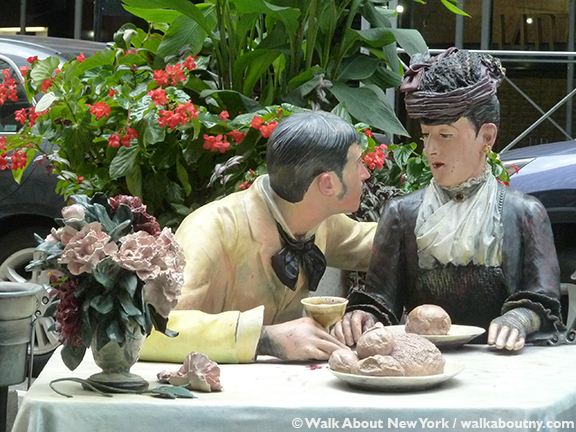 “A Turn of the Century” detail, 1995 by Seward Johnson. Pierre-Auguste Renoir’s 1883 Dance at Bougival is brought to life in Mr. Johnson’s A Turn of the Century. The Museum of Fine Arts in Boston owns the original. Some may say that these are Renoir’s most recognized dancers as they make a full circle. The details that Mr. Johnson has brought to his casting include cigarettes on the floor and the bouquet of violets near the hem of the woman’s dress. 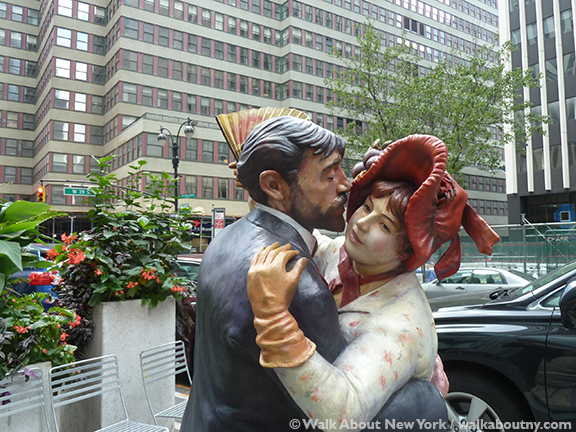 “Whispering Close” 2000 by Seward Johnson. 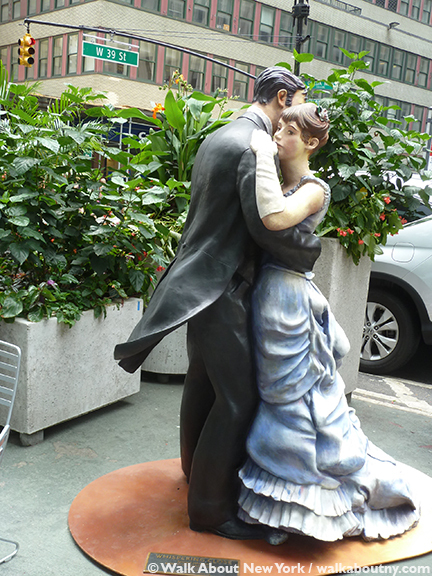 Pierre-Auguste Renoir’s Dance in the City became Whispering Close in the hands of Mr. Johnson. The painter’s 1883 original is owned the Musée d’Orsay in Paris. In Whispering Close Mr. Johnson allows us to see the dancers’ faces. In the original oil painting, only the woman’s face can be seen in profile. Party crashers: “Eye of the Beholder” 2005 by Seward Johnson. “Eye of the Beholder” detail, 2005 by Seward Johnson. Two crossword puzzle solvers sat with the earnest young man and the aloof woman in Eye of the Beholder. Mr. Johnson took his cue for this work from Edouard Manet’s 1879 Chez Père Lathuille. Eight castings were made of Eye of the Beholder. Notice the waiter, holding a coffeepot, looking on from a distance at the couple spending time in an outdoor café. Mr. Johnson’s title for the scene is intended to capture the waiter’s point of view. The original is in the collection of Musée des Beaux-Arts, Tournai, Belgium. 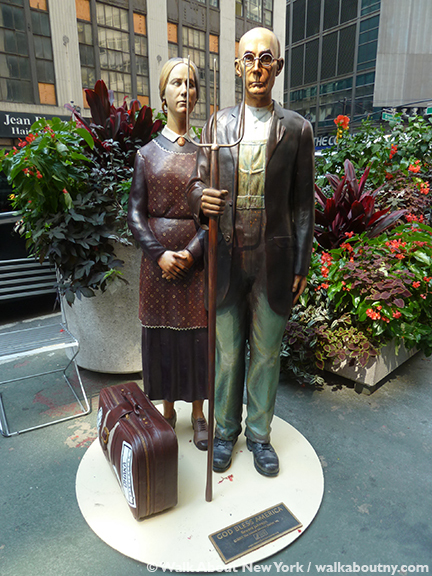 The stoic couple: “God Bless America” 2005 by Seward Johnson. There they are, the farmer with his pitchfork and his wife (although some say his daughter), wearing her prim and proper cameo, liberated from the canvas that can be found at the Art Institute of Chicago. They look as excited about their visit to the Big Apple as they do about standing in front of their whitewashed farmhouse in Grant Wood’s 1930 oil painting. The models that Mr. Wood used for American Gothic were his sister Nan Wood Graham, and Byron McKeeby, his dentist. Again, everyday folk immortalized in art. “God Bless America” detail, 2005 by Seward Johnson. The suitcase at the couple’s feet is Mr. Johnson taking poetic license; the painting stops at the waist. The suitcase has been interpreted in two ways. One, it suggests the traveling status of the sculpture. Two, it points to American jobs being shipped overseas. Given that the stickers come from Thailand; Bangladesh, India; Shanghai, China; and Taiwan, I would give the second interpretation more weight. There is also a 25-foot tall, 30,000-pound version of God Bless America ; it has seen the sights on Chicago’s Michigan Avenue; in Mesa, Arizona; Indianapolis; and Dubuque, Iowa, the state where the painting is set, where Mr. Wood was born and raised, and where he taught in a one-room schoolhouse. 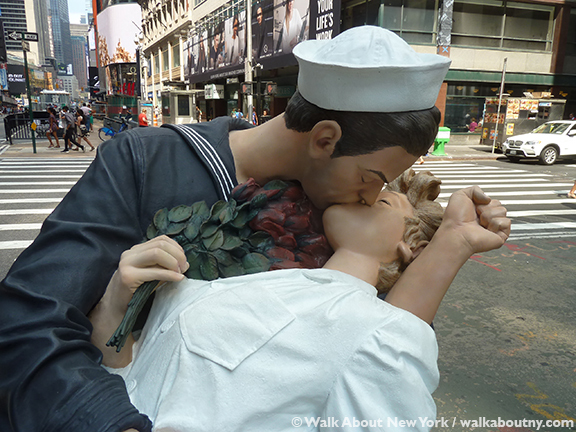 Kiss and tell: “Embracing Peace” 2004 by Seward Johnson. “Embracing Peace” detail, 2004 by Seward Johnson. 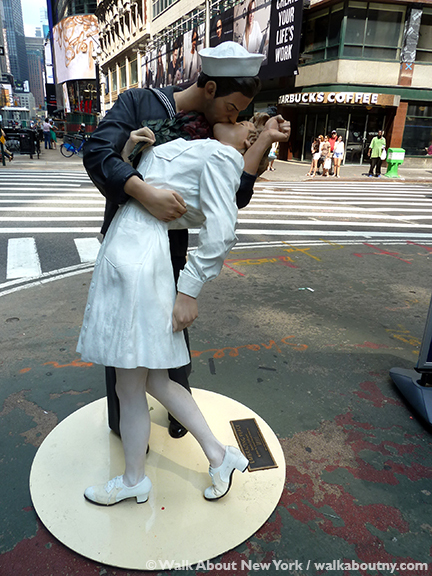 As part of the events marking the 70th anniversary of the end to World War II, a 25-foot-tall version of Embracing Peace, will be placed in Times Square for a few days around August 15th, V-J Day. Notice Mr. Johnson’s attention to detail: the dental assistant’s shoes (below) have a textured piece at the front. 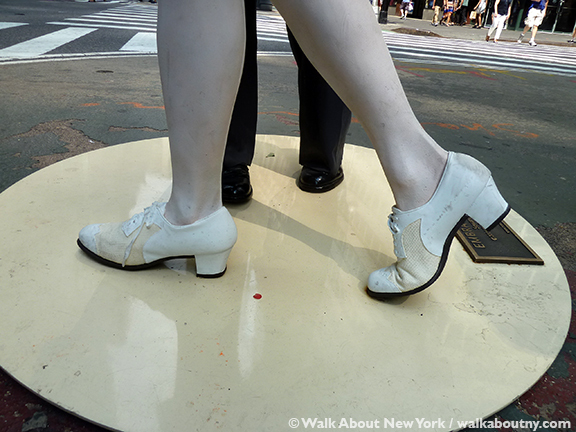 Sensible shoes: “Embracing Peace” detail, 2004 by Seward Johnson. The image of a modest Marilyn Monroe holding her hands demurely on her skirt to push it back down from “The Seven Year Itch” is a familiar one in the minds of late 20th and early 21st-century public. Mr. Johnson has captured the very moment when her white dress billows up caused by the gust of air at a subway grate, as the train passes beneath. In the movie Miss Monroe’s character was thrilled! “Forever Marilyn” 1996 by Seward Johnson. Miss Monroe symbolizes for every man who is interested the woman he desires. This life-size, frozen-in-time version was willing to pose with some of those men. A 26-foot tall version is on display at Mr. Johnson’s Grounds for Sculpture in Hamilton, NJ, and it has been seen in Chicago and elsewhere. 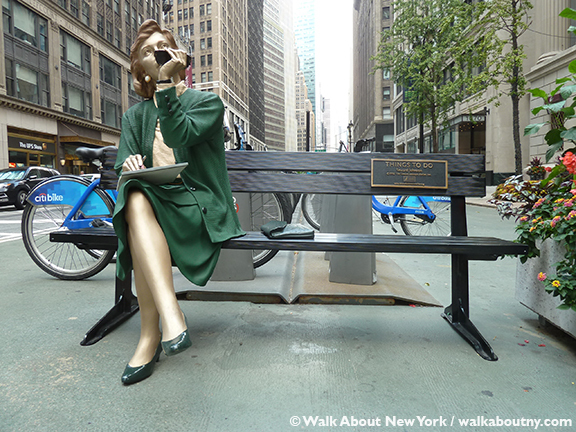 A New Friend: “Forever Marilyn” 1996 by Seward Johnson. Titled Return Visit this realistic image of President Lincoln greets, what Mr. Johnson calls “the common man” holding a copy of Lincoln’s Gettysburg Address. A version of this grouping stands near the historic Wills House on the Gettysburg town square. “Return Visit” 1991 by Seward Johnson. 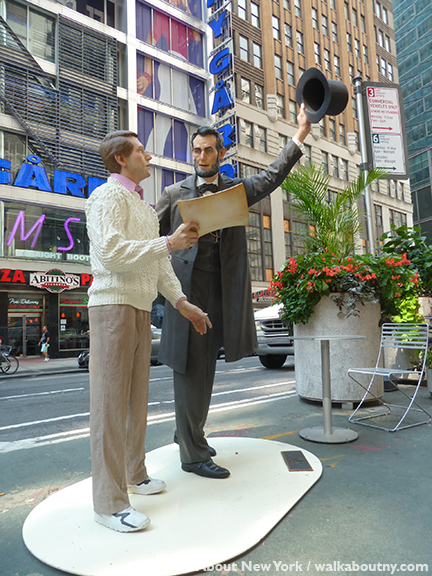 With his stovepipe hat, Lincoln gestures to the Wills House; that is his way of explaining where he finished writing his famous speech. It was in the second-floor room that he stopped for the night as a guest of David Wills. The Lincoln Fellowship of Pennsylvania commissioned the piece from Mr. Johnson; and dedicated the sculpture on November 19, 1991. It was on that date in 1863 that Lincoln dedicated the Soldier’s National Cemetery, and when he delivered the speech. 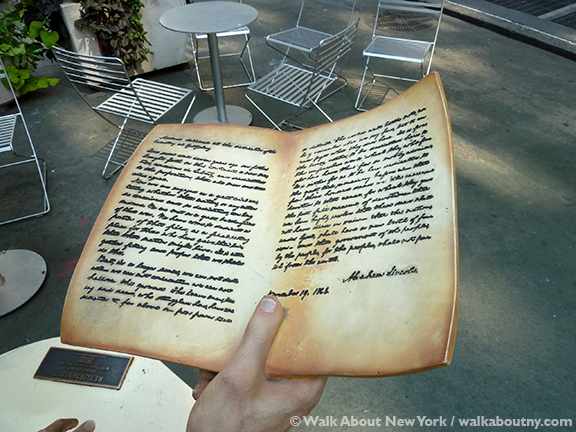 “Return Visit” detail,, the Gettysburg address, 1991 by Seward Johnson. 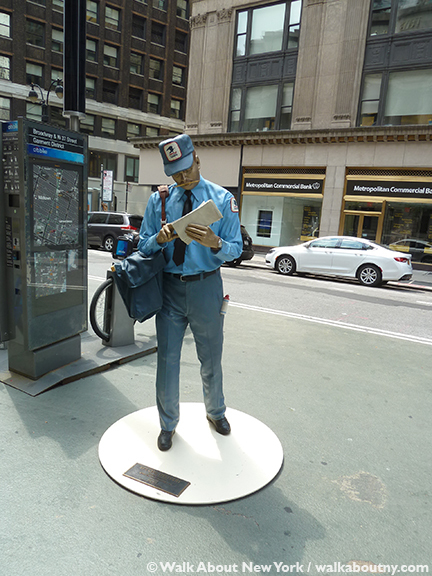 Tour guests on the Five Squares and a Circle Tour have been swept up in the good summertime fun when the Tour passes these bronzes on Broadway as we make our from Herald Square to Times Square. Take the Tour; Know More!